Ten Appetite for Health fans will win a sampling package of Bakery on Main’s Gluten Free Granolas. If you’re not familiar with Bakery On Main, it’s a family-owned bakery that started on Main Street in Glastonbury, CT. The Bakery specializes in high-quality gluten-free baked goods that are still made with great care in small batches. 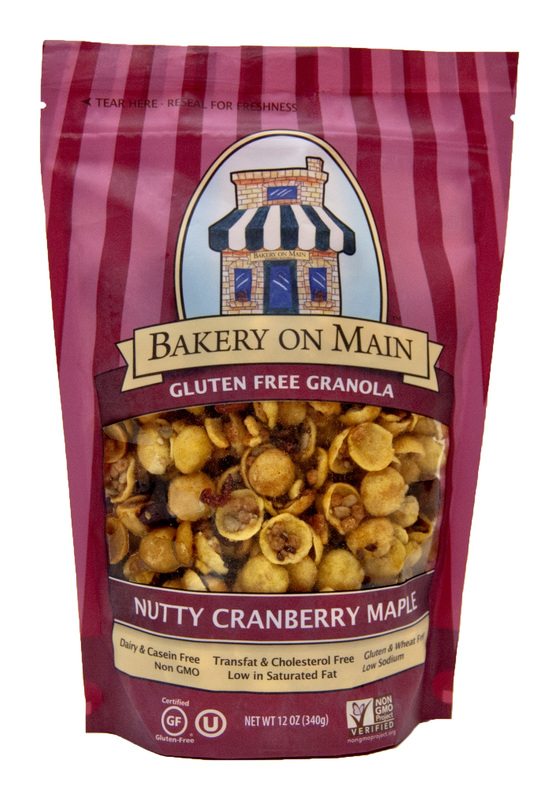 To make their gluten free granola, Bakery On Main gently toasts corn flakes and rice crisps with sesame, sunflower, and flax seeds into golden clusters of crunchy goodness. It’s great for breakfast, or as a snack. My favorite combo is plain Greek yogurt topped with granola. A serving has less than 150 calories, is low in fat and provides fiber and protein. 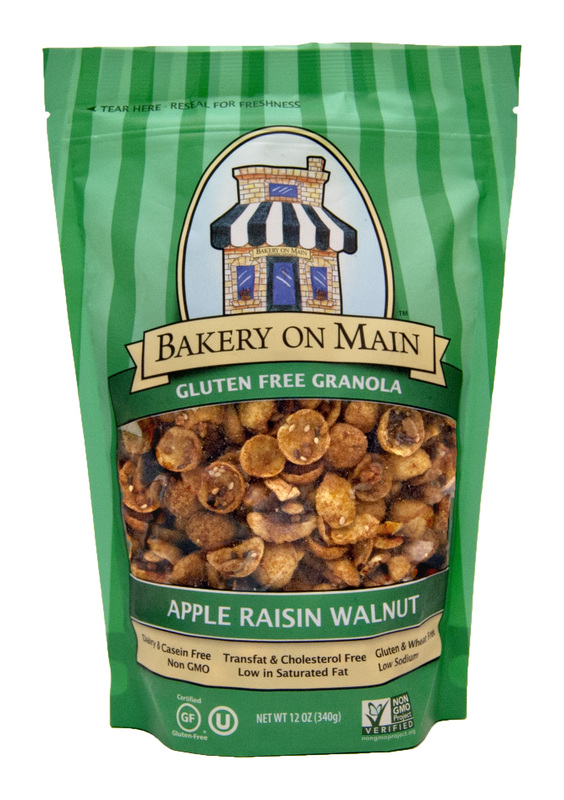 Bakery On Main’s Gluten-Free Granola is available at select retailers across the country and online. Varieties include: Cranberry Orange Cashew, Apple Raisin Walnut, Extreme Fruit and Nut, Nutty Cranberry Maple, and Rainforest Banana Nut. 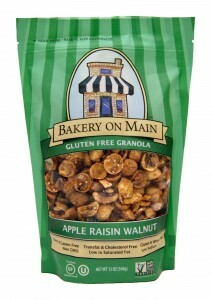 Ten Appetite for Health fans will receive a sampling pack of Bakery On Main’s Gluten-free Granola. “Like” Appetite for Health on Facebook”AND “Like” Bakery on Main. Tell us in the comment section below this post (not on our Facebook site) why you’re excited to try the granolas. I am excited to try their granolas because the ingredients sound great, and the flavors sound delicious! I’m excited to try these granolas because they are a change from oat-based granolas. These granolas sound really good because of the fruit and nuts that are included. I love adding the extra crunch to my yogurt! I already love this granola! My favorite is the nutty cranberry maple, great for breakfast or a crunchy snack. So many flavors I’d like to try! Cranberry Orange Cashew and Rainforest Banana Nut are my top choices. We like granola on our yogurt or even straight out of the bag. Good morning. My mother-in-law is gluten intolerant, so we’re always looking for gluten-free foods that she can have. Bakery On Main granola sounds great for her. This granola sounds healthy, with appealing flavors. Bakery On Main’s Gluten-Free Granola looks yummy and sounds healthy! These sound and look so delicious! Healthy & tasty! Love it. I’m excited to try these granola’s because I like trying products that I’ve never had before. They sound delicious and healthy. Let me start off by saying that I love granola and go through it like there’s no tomorrow! Every brand has a unique flavor and I like to give them all a try, one just never knows when they’ll find that product they can’t live without. I do like that it contains no refined sugars and its low in fat. All of the flavors sound amazing from the Apple Raisin Walnut to the Rainforest Banana Nut! I have heard they are yummy, but most importantly non gmo and gluten free!! I like AFH and Bakery on Main on Facebook and posted on FB, Tweet. I’m excited to try this granola to add flavor to my plain yogurts and more. I would love to try it because it is healthy and sounds delicious!!! These flavors sound yummy and granola is one item that everyone in our family enjoys. I have “Liked” Bakery on Maine on Facebook. I am most excited to try the granola’s because I want to try all of the varieties! Cranberry Orange Cashew, Apple Raisin Walnut, Extreme Fruit and Nut, Nutty Cranberry Maple, and Rainforest Banana Nut.